After reading Nick Davies' 'Flat Earth News', Ceasefire's Matthew Butcher finds that the book provides an illuminating context to why press coverage of the Oslo massacres was so dismal. As workers across Britain streamed out of their offices at five o’clock on Friday 22nd July they did so in the knowledge that something terrible was unfolding across the North Sea in Norway. A country known for its tranquillity had been shaken by a bomb attack in the capital city and, for those working late on this particular Friday, reports were emerging suggesting that a lone gunman was shooting people on an island outside the capital. It took everyone by surprise, especially the media. Within six minutes of running a live blog on the bombing, the BBC were re-running a Reuters report that made links between the attacks and al Qaeda. By the time Britons were at the pub or eating their dinner, the Beeb’s experts were suggesting that ‘al Qaeda-influenced groups’ were behind the attacks. 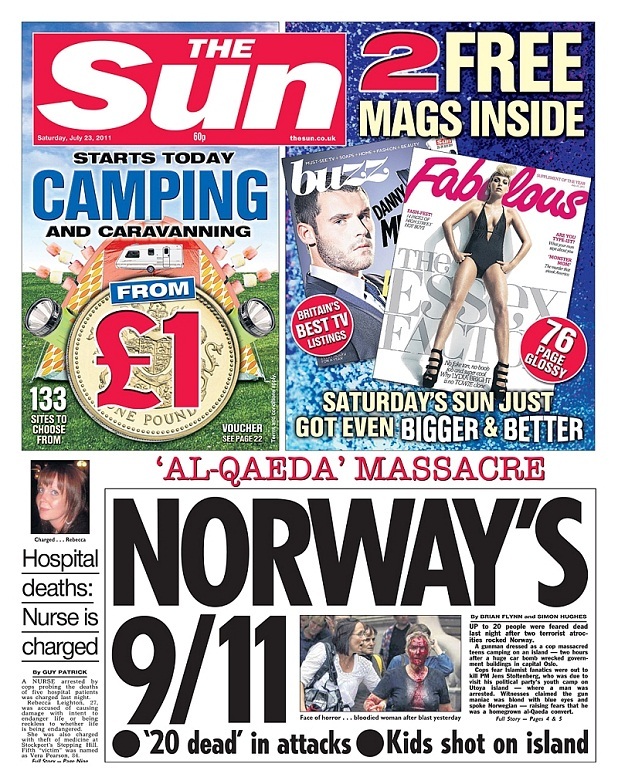 The Sun, read by up to 7.6 million people, proclaimed on a front page it had been preparing for next day’s edition, that there had been an ‘Al Qaeda massacre’. Europe was, it seemed, under attack from Islamic extremists. Until, that is, the truth began to make its way into the story. 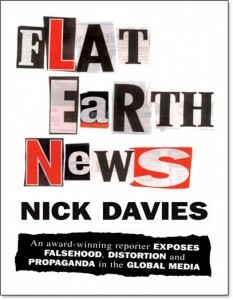 Journalists had, in their rush to keep up with the story, been caught up in a wave of what Nick Davies, in his book ‘Flat Earth News’ called ‘churnalism’. The modern-day media has found itself in a toxic situation. Staffing levels at national newspapers have stagnated since the Wapping disputes in the 1980s, yet the amount of space that journalists have had to fill has trebled since. Crucially, as Davies points out, ‘the average time allowed for national newspaper journalists to find and check stories has been cut to a third of its former self’. Add to this the huge pressure that online news puts on the production of stories and you begin to see how misinformation makes its way so easily into the accounts we end up reading. At the BBC the rise of 24 hour news has come at the same time as cuts to the number of journalists. The result is clear: more news and less fact. So as Anders Behring Breivik murdered children on Utoya Island, British media outlets in Britain were locked in a battle to break any developments first. At times like these, the ‘wires’ (or news agencies such as Associated Press and Reuters) play an important role. In the case of the Norwegian atrocities, the news, and the almost immediate connection being made to Al Qaeda were coming through from Reuters, an agency plagued by journalistic job cuts in the last decade. An astounding 34% of online news from major media organisations is, as Davies says, ‘simply reproduced from news agencies’. These agencies, spread increasingly thinly across the globe, officially aim to provide simple and accurate news quickly. Media organisations, whose journalists are extremely overstretched, are meant to check the facts. The combination does not create trustworthy news stories. According to Gary Younge, 0.4% of terror plots in Europe are carried out by Islamists. That means that there was a 99.6% chance that the attack on Norway wasn’t, as the media had decreed early on, the work of al Quaeda or someone close to them. There may, of course, be an element of Islamaphobia in the mainstream media, as there is in the general population, but it is the incessant drive towards sensationalism and speed in our news, at the expense of the truth, that sent Britons home with the wrong idea on that Friday in July.